Punk Rock is a music genre that developed in the mid-1970s in the United Kingdom, the United States and Australia. 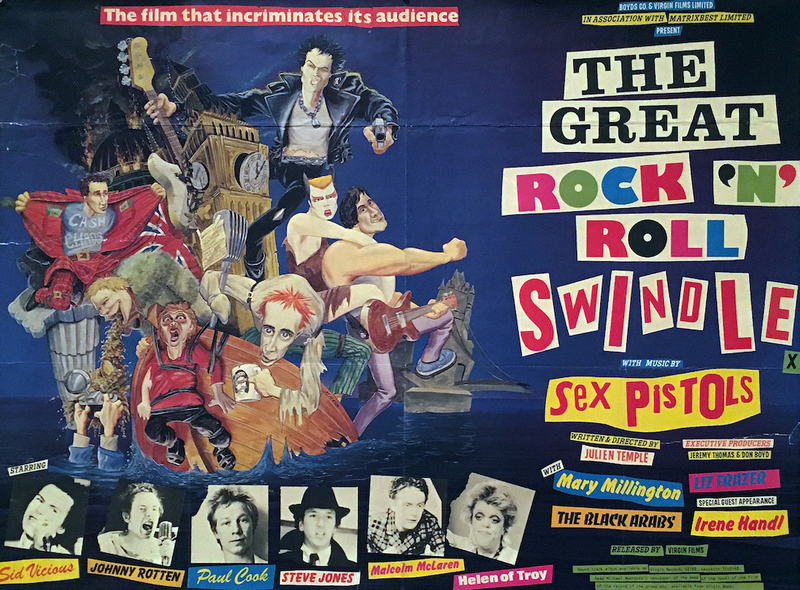 Rooted in 1960s garage rock, punk rock bands rejected perceived excesses of mainstream 1970s rock by typically producing short or fast-paced songs, with hard-edged melodies and singing styles, stripped-down instrumentation, and often political, anti-establishment lyrics. Punk Rock embraces a “do it yourself” ethic; many bands self-produce recordings and distributes them through independent record labels and other informal channels. Accompanying the music is byproduct: a distinct style of graphic art. Although I was there during this time, and in the early throws of raising a family, I was not drawn to the anti-establishment, but rather seduce by the music of Motown, Detroit Jazz, and the 60’s music of the Beatles, Rolling Stones, Sting and Bob Dylan. Punk Rock was a distraction for this writer and as an observer, I missed the graphic art side of the cultural phenomenon. If that resonates, no matter what your age, this exhibition opens up a trove of information and design that can take you on a journey and easily introduce you to a culture defined, in part, by its graphic design. 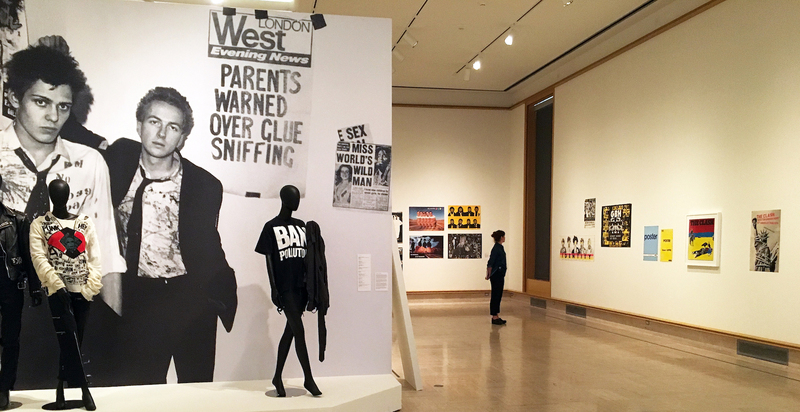 The Cranbrook Art Museum opened a large and sprawling exhibition of Punk Rock Art Graphics (600 pieces), Too Fast to Live, Too Young to Die: Punk Graphics, 1976 -1986, 0n June 15, 2018. 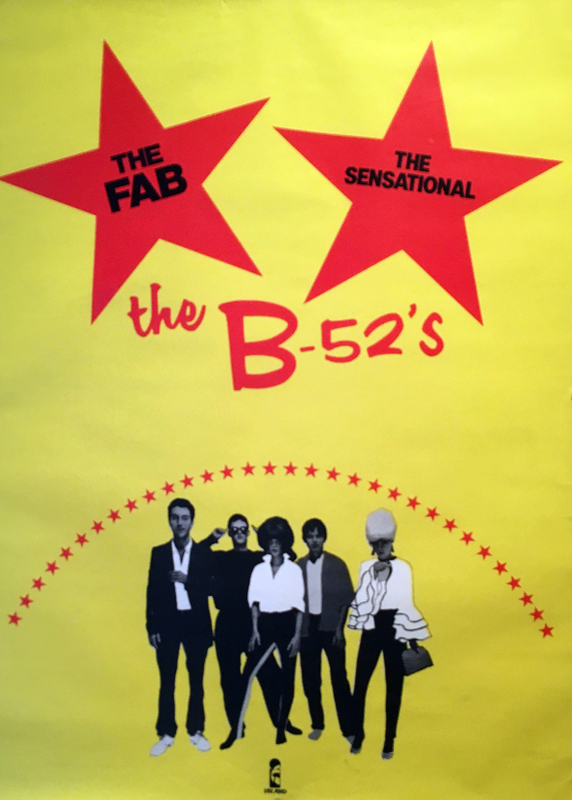 The exhibition features several hundred posters, flyers, fanzines, handbills, record sleeves, badges, clothing and other graphic materials from the New York collector Andrew Krivine. In addition Robert St. Mary, a local author and music historian, helped to curate the Detroit portions of the exhibition at the request of Cranbrook Art Museum. St. Mary was asked to contribute his knowledge of the Detroit punk scene as an extension of a project he is working on as a recipient of the 2017 Knight Foundation Arts Award. In his 2015 book, “The Orbit Anthology,” St. Mary focused mainly on the punk scene at Bookies, known as the original punk nightclub in Detroit. Most people know about the famous London, New York City and Los Angeles bands, but St. Mary points out that the origins of punk are really right here in Detroit. While Too Fast to Live isn’t an exhibit based on musical history, it does present a chronological timeline tracing the evolution of the punk and new wave music genres overseas and in the U.S. via New York City. During this era, New York served as ground zero for a critical mass of counterculture musicians and artists who were forging an aesthetic that continues to be an influential force in contemporary design. 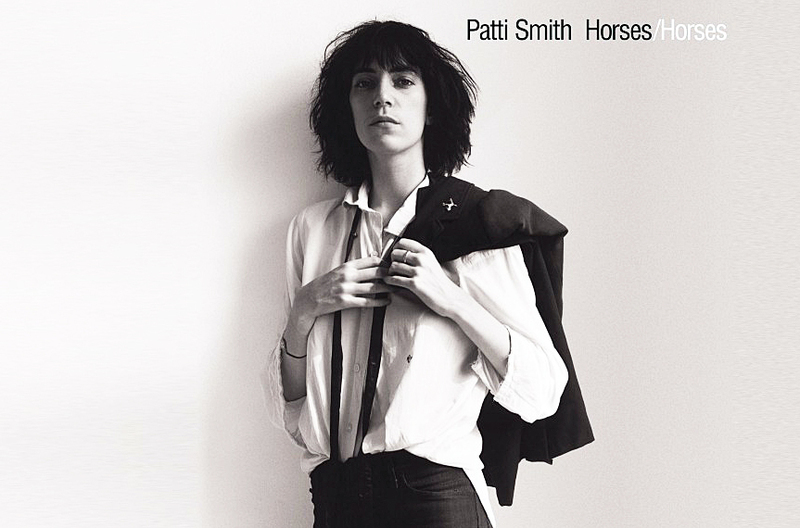 In her debut album, Horses, 1975, Patti Smith became a fixture in the New York punk rock scene. 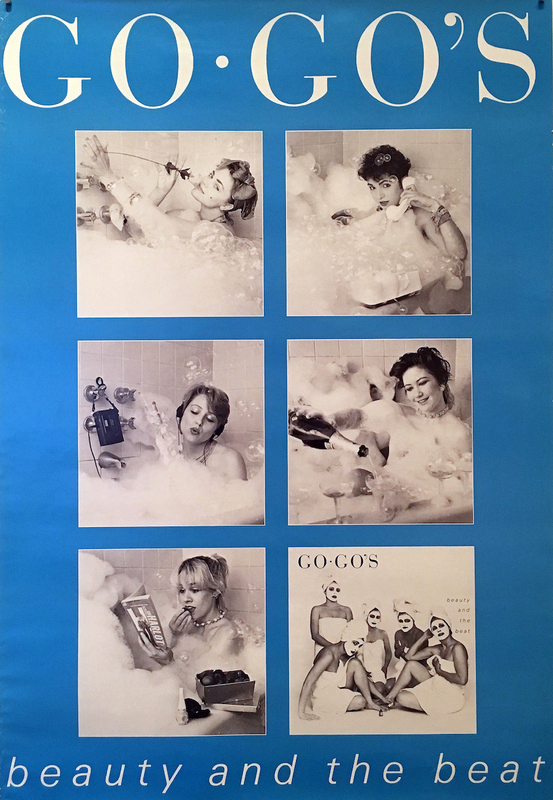 Critics have viewed the work as one of the most influential albums in the history of the punk rock movement. Her three-cord rock was a simplistic cord structure, with rudimentary guitar work, and lyrics channeled by influences from William Blake to Arthur Rimbaud. Her performances often provided room for musical improvisation, and drew at times on Reggae, and jazz riffs. Horses mixed philosophical elements with traditional rock elements. Her early biography bleeds over into the life of Robert Mapplethorpe, who took the black and white image for the cover, as the two live together for a short time in lower Manhattan. 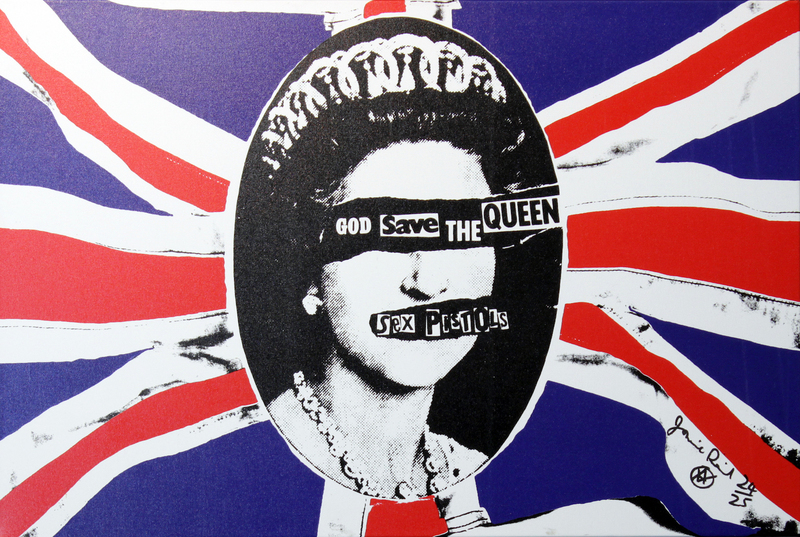 The design of punk graphics ran concurrent to postmodern art practices of the times by raiding popular culture, scavenging history, subverting messages, and transgressing aesthetic rules. Punk fed the alternative music scene that would emerge in the late 1990’s as well as today’s do-it-yourself cultures that blur and erase the lines between professionals and amateurs. Punk’s trangressive spirit emboldened people from all walks of life to reimage themselves as creative agents and active participants in a culture driven by music, art, and design. The legacy of punk has permeated modern culture and society, and its visual vocabulary infuses much contemporary art, while the punk spirit resonates in particular with the anti-elitist, DIY ethos of today’s young, blogging artists and musicians. Too Fast to Live…, recalls the anarchic spirit of authenticity and amateurism, the volatile and ambiguous celebration of negativity, and the creativity that was punk. Too Fast to Live, Too Young to Die: Punk Graphics, 1976-1986” and the related Shepard Fairey. Salad Days,1989-1999 run June 16-October 7, 2018. Some sixty years ago, in the spirit of the Avant-garde, earthworks artist Robert Smithson– among other American artists like Donald Judd, Dan Flavin, Sol Lewitt—attempted to escape the confined space of the traditional artist’s studio, and to undo the tyranny of studio practice by redefining its traditional image/object making , and by commencing what he called an “expeditionary art.” Taken to meandering the industrial landscape of Passaic New Jersey, Smithson took Instamatic photos of commonplace industrial infrastructural constructions (bridges, smokestacks, drainage pipes) and, like Duchamp did with commonplace artifacts he called “readymades,“ Smithson re-recognized industrial infrastructure as monuments to civilization. Eventually also touring Mayan Mexico, he inserted mirrors in odd locations of the landscape to multiply and redefine Mexico’s already surreal visual landscapes. Smithson finally explored the arid landscape of the American West where he created his Spiral Getty, the greatest of American earthworks, on the Great Salt Lake. Scott Hocking, a kindred Detroit artist founded a similar practice two decades ago by meandering and drifting through the eroding landscape of Detroit. Out of found materials appropriated from abandoned factories and office building, he created ephemeral monuments of the derelict remains of the city; at once archeologist and alchemist, he photographed them as part of the project. Among his many captivating projects Hocking created a huge stone egg in Michigan Central Train Station. He constructed a ziggurat in the Fischer Body 21 factory. He built a pyramid of abandoned car tires on a suburban lawn. 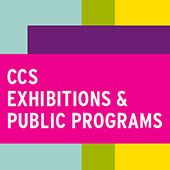 Hocking has continued that practice on an international level with 22 site-specific projects throughout the world to date including works in France, Germany, Australia, Iceland, China, as well as throughout Michigan, Florida, New York; he now returns to the confinement of the Gallery space with an understated, thematically charged exhibition. Scott Hocking, “Old,” 2018, gypsum, patina, salt. “Scott Hocking: Old” returns him to the traditional, white box space of an art gallery at the David Klein gallery, and is a challenging summation of Hocking’s artistic process. The center piece of the exhibition is the Klein Gallery’s Greek column that sits in the main entrance of the gallery. 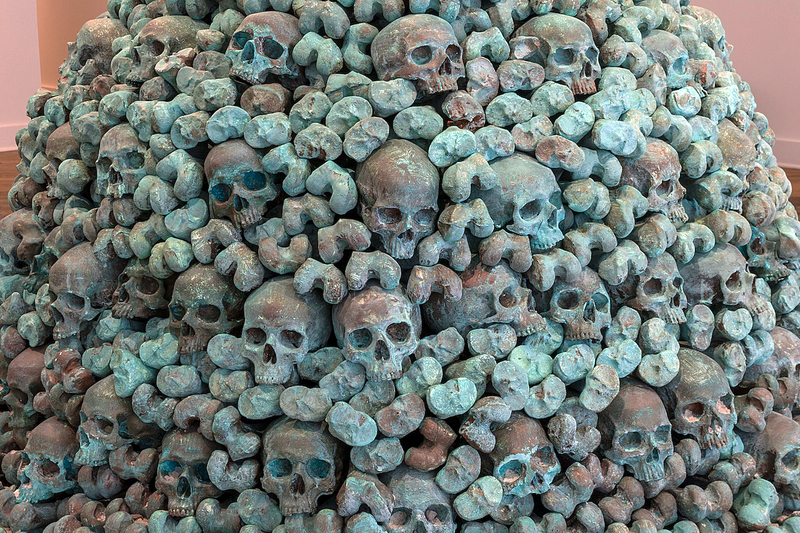 Riffing on the catacombs of Paris (which he visited) where the skeletons of millions of Parisian inhabitants were removed from cemeteries and placed in the ancient stone mines under the city, Hocking saw Detroit, as literally built upon the bodies and excruciating labor of human beings (autoworkers?). 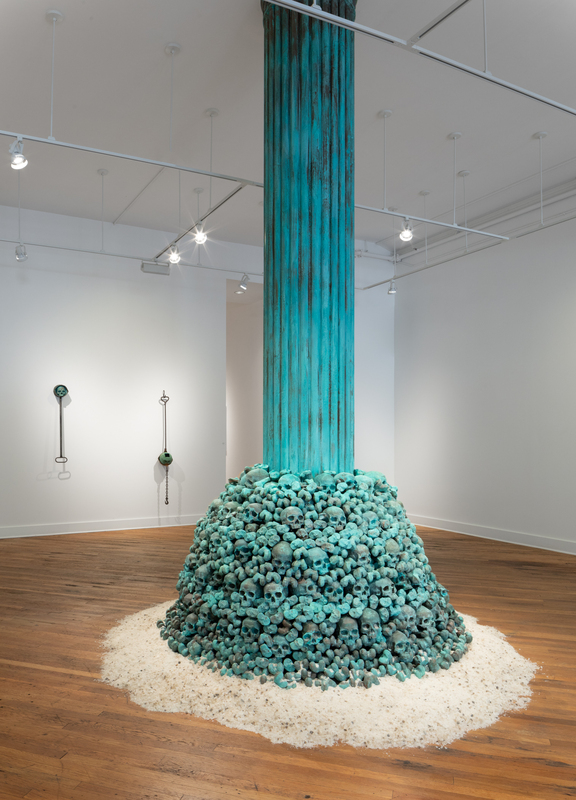 Symbolically surrounding the Klein gallery column (Hocking sees it as a huge structural bone) are thousands of bones and skulls cast by Hocking of hydrocal, made from locally mined gypsum, directly echoing Hocking’s own experience in the Paris catacombs, creating a monument to the souls that created Detroit. Somewhat macabre but in the tradition of gothic cemetery imagery, Hocking’s column, painted with a copper patina, and surrounded by a ring of salt crystals (mined from the ancient sea bed beneath Detroit), reflects his own family history of Cornish copper miners who worked in copper mines, thousands of feet underground, in Northern Michigan. Punctuating the front room of the gallery, are six inscrutably mysterious artifacts created by Hocking of copper and tin and that are symbolic of the ancient history of copper mining in the Great Lakes area and of the presence of copper everywhere, from decorative architectural elements to the copper wire in Detroit’s electrical infrastructure. 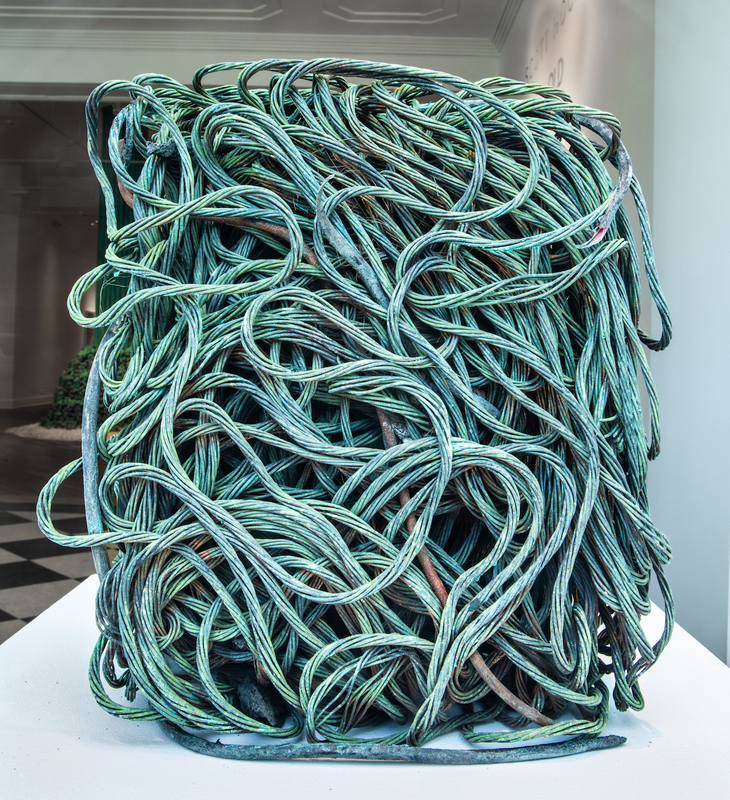 Most notably, “Country Boy,” the labyrinthine block of tangled copper wire in the front window of the gallery, is a “portrait” of a copper scrapper (homeless people who surreptitiously remove copper from derelict buildings and sell it) from whom Hocking bought the coiled wire. Country Boy, one of the many scrappers who Hocking had befriended in his research, had been killed in a hit and run. Like many of Hocking’s pieces it is at once a singularly amazing object and, like much of Hocking’s art, a spot-on invention. 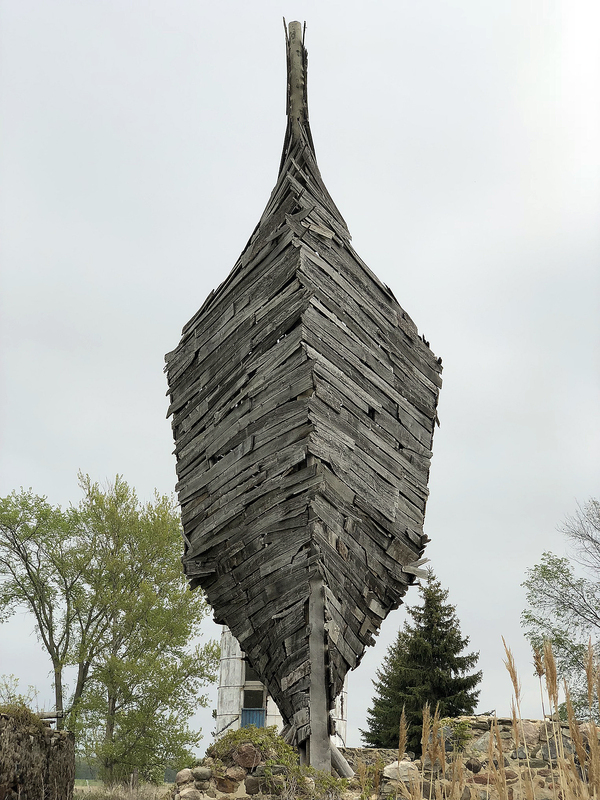 Photographic documentation of Hockings projects fill out the exhibition, including photographs of a 2015 site-specific sculpture that he composed of, and on the site of, an eroding barn in the “thumb” area of Port Austin, Michigan. 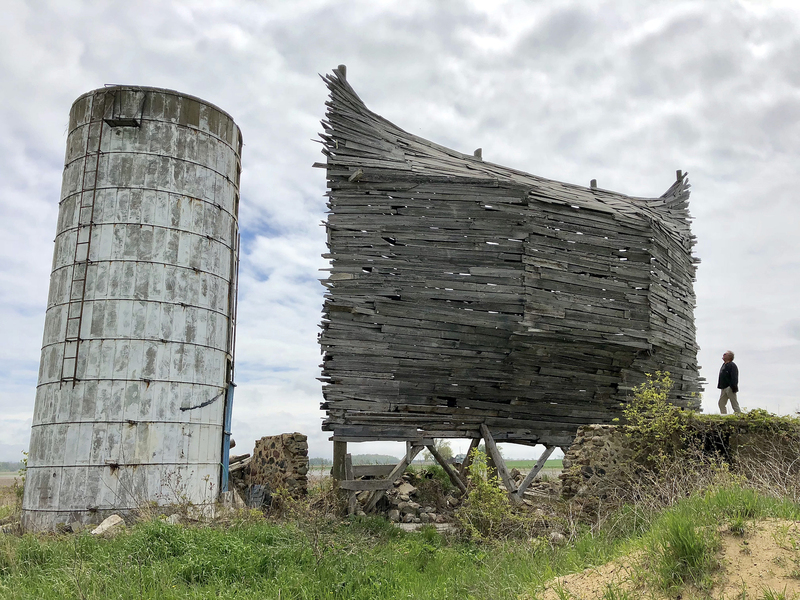 Commissioned by an area farmer (this is the second barn-art commission in the area), Hocking raised a collapsing 19thcentury barn and rebuilt it “upside down” to create an as big-as-a-barn, ark-like sculpture in the middle of a farm field. A recent excursion to see the project revealed a hallucinatory-like structure amidst an enormous farm field. Walking toward the ark from half-mile distance, across the field of ankle-busting clods of furrowed mud, with the drama of a huge sky of scudding clouds as a backdrop, combined to create a dizzying, biblical-like experience. The eerie, voice-filled, wind, epic sky, huge, distant trees waving in slow-motion, evoked an unforgettable cinematic presence. 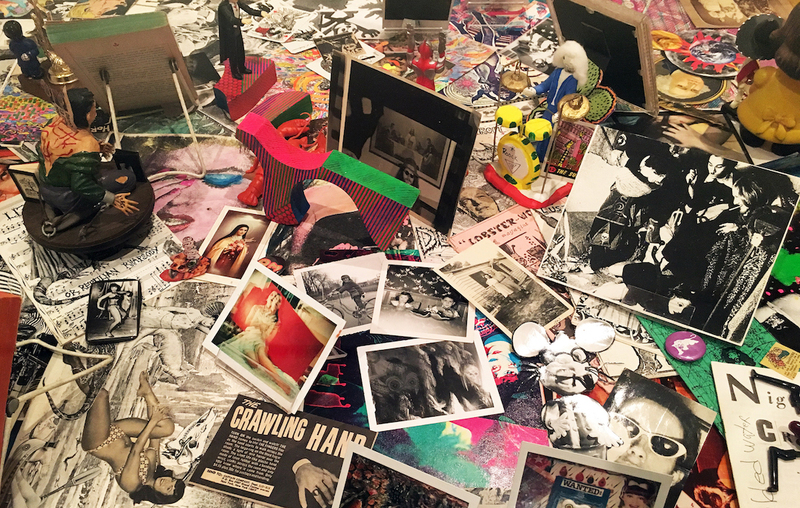 Collectively, there is an uncanny element in Hocking’s site-specific projects where one perceives multiple forces, both metaphorical and real, and an esoteric body of ideas such as astrology, alchemy, and astrotheology, at work. In Hocking ‘s description of the origins of the Barnboat (also called The Celestial Ship of the North and Emergency Ark), he refers to an Egyptian myth that depicts the crescent moon, waxing or waning, floating upon the horizon of the sea as an ancient version of Noah’s Ark. Like the ancients then, Hocking relies upon observation of the forces of nature, the planets and moons, and myths and cosmologies to situate his art. His “Celestial Ship of the North” refreshes our mythological eyes and prepares us to see, like Smithson’s Passaic Industrial landscape, the world in a different light. He sees the world, not in terms of art history and its successive permutations, but in terms of mythologies, ancient history and material culture. Most of Hocking’s many site-specific installations have been destroyed, removed, or lie remotely inaccessible, but the energy and visionary magic that created them resides in the documented photographs. In addition to photographs of the Barnboat there is documentation of four other site-specific projects in “Old” that captures the energy and immediacy of Hocking’s process. In a residency at famed Australian artist Arthur Boyd’s home, among the uncanny, serendipitous and inspired events in Aboriginal landscape, Hocking discovered a photograph of another Australian artist, Sidney Nolan, mounting a dead horse. 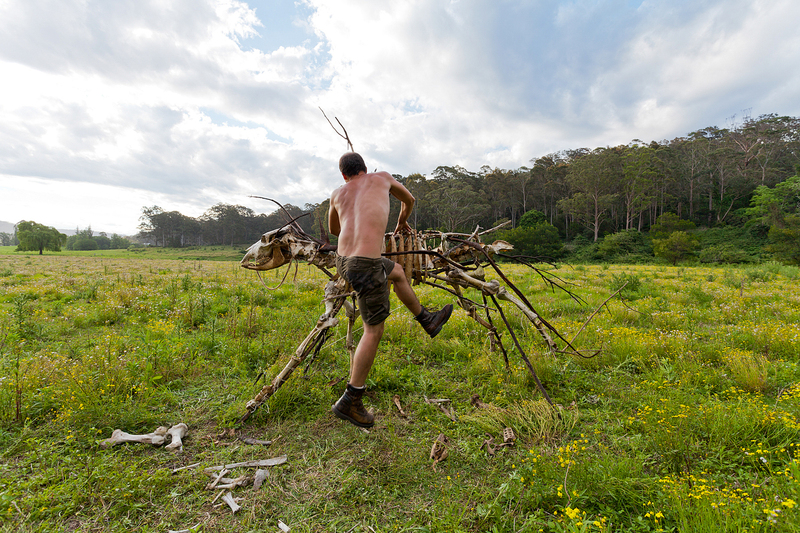 In the Australian outback of Boyd’s property, Hocking discovered the bones of a cow that had been devoured by another creature; he reassembled them into the shape of Sidney Nolan’s dead horse, and then photographed himself attempting to mount it. Like a movie still that evokes the movie’s story, Hocking’s photo is a surreal instance of the strange domino effect of the forces (art engenders life) that create meaning in art or life. Davis Cone, American, born 1950. State-Autumn Evening, 2002. Acrylic on canvas. 26 1/2 × 46 ½” Collection of John Gordon. According to the ancient historian Pliny the Elder, two rival artists, Zeuxis and Parrhasius, once had a public competition to determine which of the two was the better painter. When Zeuxis unveiled his painting of a bowl of grapes, the story goes that they were so realistic that birds approached the painting and pecked at it. Convinced he had won, Zeuxis turned to his rival and asked him to unveil his painting. But Zeuxis had been deceived; Parrhasius had merely painted a very realistic image of a veil, which had fooled not just Zeuxis, but everyone present, and he was thus declared the winner. The tradition of hyper-realistic painting never died, and even in the 20thcentury when abstract expressionism took the world by storm, some artists chose instead to rebel against the rebels by creating paintings that rivaled photography in their realism. 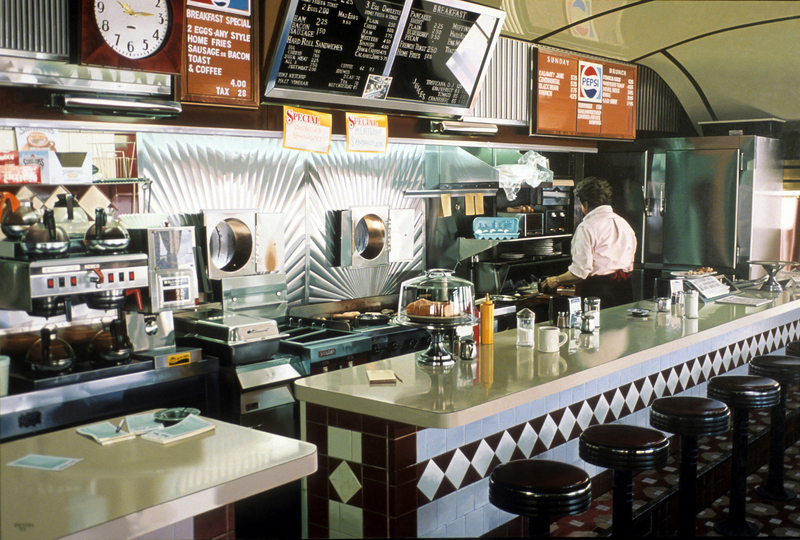 Through August 12, a fine survey of the first and second generation of photorealist painters is on view at the Flint Institute of Arts, emphatically making the point that the realist tradition is alive and well. The show snugly fills the spacious Hedge and Henry galleries at the FIA, and traces the history of photorealism from 1969 through the present. The movement began in densely populated areas in America’s east and west coasts, and the subject matter frequently featured the stuff of urban life. Early photorealist artists like John Salt and Robert Bechtle produced candid images of automobiles, going out of their way to not beautify the mechanized, industrial world of postwar America. 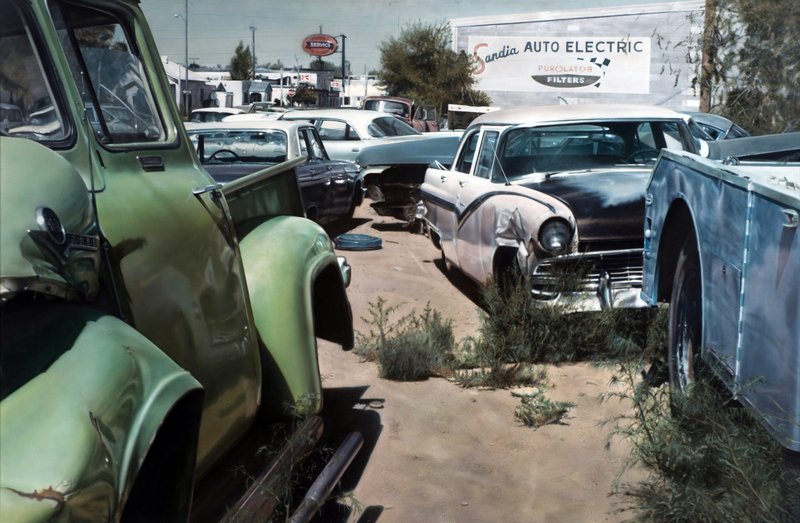 John Salt’s Albuquerque Wreckyarddepicts a junkyard populated with abandoned cars. Although the scene is unidealized, Salt flaunts his deft ability to connivingly translate reflective chrome surfaces into paint, and the effect is visually striking. The painting also works as understated social commentary on consumption and waste. Tom Blackwell’s arrestingly large paintings take a different approach, focusing instead on the aesthetics of the wiring and mechanical components beneath the hood. His Indian’s Chopper Modified ’57 Harley offers us a close-up of the inner workings of a motorcycle. Divorced from any frame of reference or context, the highly reflective chrome and the intricacies of the engine components almost become a work of abstract art. 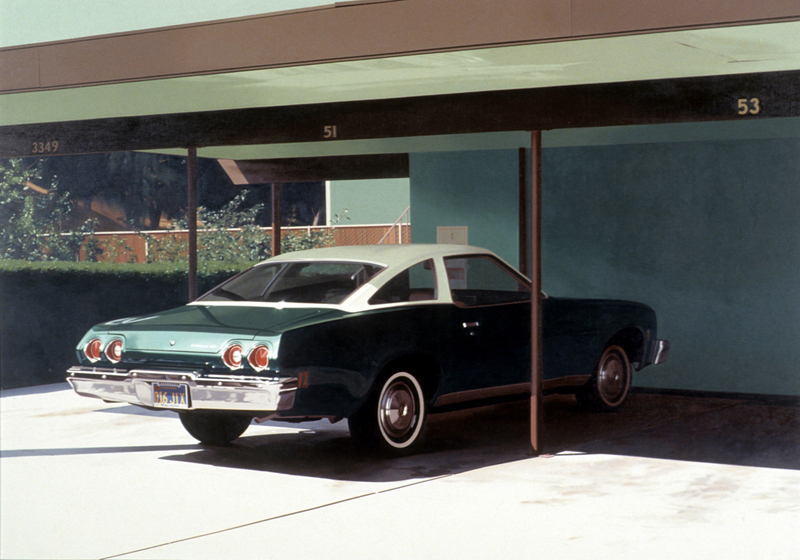 This exhibition makes clear that there are different approaches to photorealism. Some artists wanted their paintings to quite literally translate photographs into paint, replete with points of sharp focus in the foreground and blurring and distortion in the background. 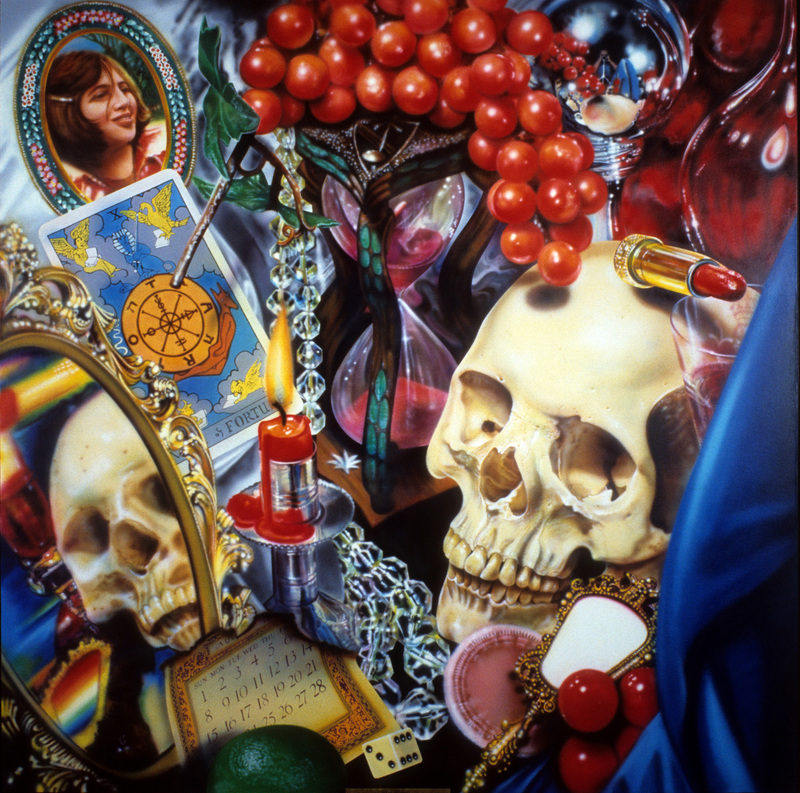 Audrey Flack’s iconic 20thcentury vanitas Wheel of Fortune, is a good example. And at almost ten feet square, this monumental painting is arguably the star of the show. Other artists believed that painting could actually improve on photography. Richard Estes’s cityscapes portray the world in extreme lucidity—both foreground and background retain crisp focus. 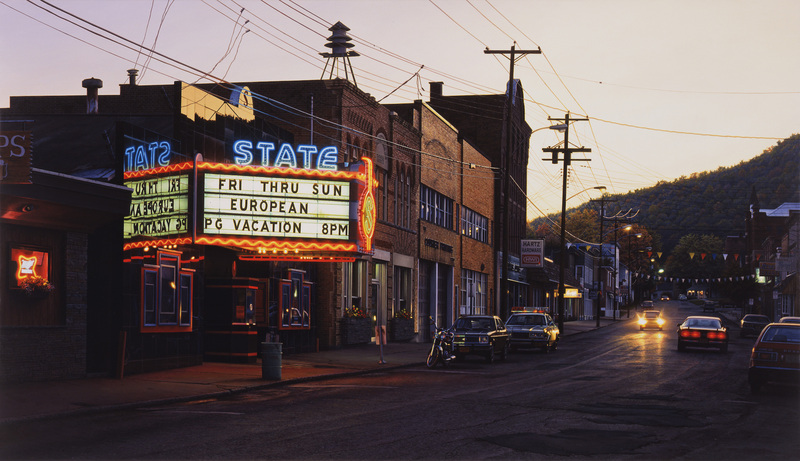 Strictly speaking, Estes is a photorealist, but his paintings certainly don’t look like photos. The show divides the exhibition into two sections, representing the first and second generations of photorealists. Unlike the pioneers of the style, the artists of the second generation have more technology at their disposal, such as the use of computer software to assist in the transfer of a photo onto canvass. The works of contemporary photorealists are every bit as satisfying as those of the pioneers of the movement. Yigal Ozeri blows up small photographs into huge paintings, and his ability to convincingly translate the sparkly dance of sunlight striking ripples in Mediterranean waters into paint is virtuosic. Perhaps the most convincing work in the show might ironically be the most passed-over, simply because it looks too deceptively real to even be a painting; in a witty demonstration of trompe l’oielwizardry at its finest, we’re deceived into thinking a cardboard box filled with money is resting under glass on a pedestal. It’s in fact a carefully-painted wooden sculpture. The visual force of these works gets lost in translation when they’re photographed and reproduced in diminutive form in print or online. Only in person, for example, looking at Richerd Estes’s Plaza, a cityscape crammed with busy details, do we see that the artist rendered the socks of a foreground figure with a few scribbled in, almost impressionistic brushstrokes. And the playful ripples in Jack Mendenhall’s Pointe Hilton, when seen close, reveal themselves to be horizontal swipes of paint, bristle-strokes clearly visible. I was reminded of Rembrandt who, in his 1654 portrait of Jan Six,shows the subject standing with gloved hands; but zoom in close on the gloves, and we see a calculatedly scribbled mess that might just as well be a detail from a de Kooning abstraction. So while the artists on view are unmistakably contemporary, the tradition in which they work extends through the centuries all the way back to the likes of Zeuxis and Parrhasius. And From Lens to Eye to Hand emphatically makes the point that even in a world oversaturated with photographic images– almost exclusively in the form of advertisements– traditional painting triumphantly retains its enduring relevance.